Our newly released 2015 vintage consists of three flavors of hard cider: Crazy Crow, Screech Owl, and Stellar Jay. All our ciders are made in small batches, using heirloom, Newtown apples grown on our farm. Fermentation is a two-step process, with the first step taking place in European made fermenting tanks for a period of 30 to 40 days. The second round of fermentation utilizes white oak barrels and gently rolls into an aging process that takes 6 plus months in oak. Finally our ciders receive a splash of local honey for bottle conditioning. There’s no hiding it -- our ciders aren’t sweet and they aren’t your everyday supermarket cider; they are extraordinary, dry, old world ciders with a new world twist! Each flavor has been influenced by our local flora and fauna, and is an ode to the beauty of the nature that thrives on our farm. Crazy Crow is a blackberry infused dry hard cider with a refreshing and crisp flavor. Screech Owl is our purest and simplest cider, taking much of its flavor from the oak barrels themselves. It has a subtle oaky flavor and vanilla notes. This dry cider’s barrel aged nature gives it a characteristic similar to that of a fine white wine. Stellar Jay is made by fermenting our Newtown cider alongside Italian plums to infuse a unique, yet subtle plumy backdrop. Topknot, our newest cider, is an apple-cherry cider, made using single varietal cider, barrel aged for six months in used European port barrels, with an infusion of cherries and honey. This process results in a dry cider, with rich notes of Port wine, cherries, and crisp apple. We are always looking for fun and interesting new ways to craft cider and collaborate with other local vendors. We hope to roll out new and seasonal flavors regularly. So check your local seller of Rivercider and check back here often to see what we are working on. Our 1,500 sq ft facility houses all the equipment necessary to take the fruit from the tree, directly to the bottle. We hand select each apple or pear prior to washing to ensure you are getting nothing but the best fruit for cider. We then grind our fruit and turn it into a mash before it is put into an Italian balloon press to extract delicious juice from each and every apple or pear. The juice is then transferred to European made fermentation tanks where it is carefully and painstakingly monitored to ensure the highest quality of cider is crafted. From there the cider is transferred to American oak barrels for further aging and fermentation. Finally, once the cider is matured and ready it is hand bottled and labeled in our cider barn. 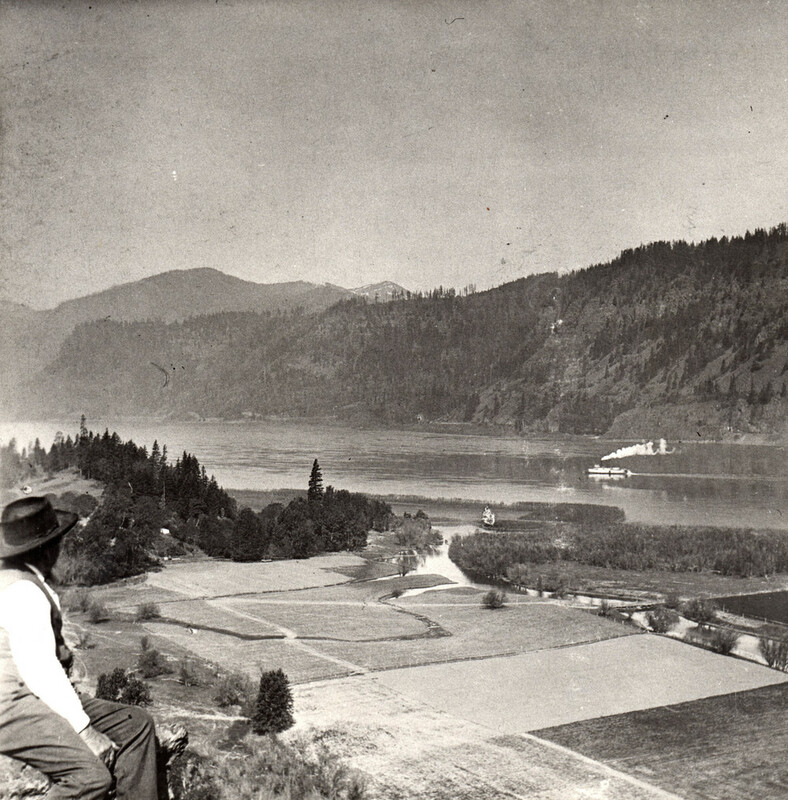 Back in 1886, Riverside Farms grew from JW Morton’s desire to grow the finest fruit and vegetable crops in the Columbia Gorge. Since then, generation after generation have invested in continuing the legacy and mission to produce the highest quality fruit here in the Gorge. Since the 1800’s J.W. Morton and his decedents have enjoyed turning their apples and pears into delicious tasting ciders. However, it wasn’t until 2013 that the process of producing this cider for the wider public was commenced. Over the last several years the family and farm staff have dedicated countless hours to perfecting the cider making process, to create nothing but the purest, and finest of ciders with all natural, GMO-free ingredients, which are always naturally gluten free. We are dedicated to using our very own, family farm grown fruit, and any additional flavor additives are always natural and sourced locally. The first batch of this modern version of our family’s cider was bottled and tested in 2013 and the decision to launch into the professional cider market was made within that year. Since we have always been a small family farm that worked within the local community we decided to keep all stages of the production on our farm, and in 2014 we invested in a “cider barn”. This on-site facility enables us to have the highest of quality control, and unlike many other cider producers, means we are there for every step of its production. We truly produce a product that is from farm to table. Growing the fruit, picking, sorting, washing, grinding, juicing, fermentation, and ultimately bottling, is all done on our farm and we commit to using flavor additives sources locally. Furthermore, we are committed to collaborating with other cideries to promote the local cider market in the Columbia Gorge. We believe that cider is made best by using only the most pure and natural of ingredients: apples, pears, natural yeasts, and local honey. It is always small batch, and there are never artificial flavors or added sugar in our products. That’s our promise and our commitment - to deliver & provide true craft cider. We are a 5th generation family farm, made up of a mother who devoted her life to growing Riverside Farms to where it is, a father who, in addition to full time employment, dedicates his spare time assisting in the cider development, a son with a passion for new ventures, and several other team members equally invested in the family legacy. OPEN BY APPOINTMENT ONLY • info@rivercider.com • Copyright ©2015 Riverside Farms. All rights reserved.